3. STOP TEXTing my BOTTOM, TEXT my face instead. 2. My lapTOP TEXT is too small, I will shoot it with this machine gun until my pet roBOT, TOM TEXT, fixes it. 1. 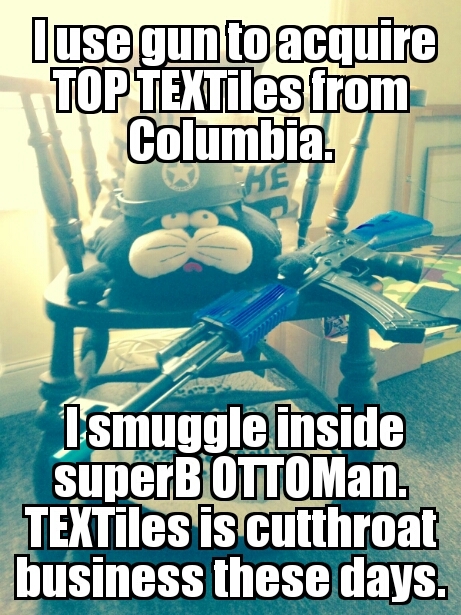 I use gun to acquire TOP TEXTiles from Colombia, I smuggle inside superB OTTOMan. TEXTiles is cutthroat business these days. Yes, Kevin, you are the winner. Had you written your entry like a normal human being rather than a half-drunken racist impersonating a Chinese man you may not have succeeded in your efforts. We’re all proud of you. Here’s to you and your wrong words! Do I get some sort of money based recognition of my awesomeness? Money based, maybe. Not actual money though. Or we shall see. Do golden coloured biscuits count as money? Yes. Or Galaxy Golden Eggs. Golden Galaxy Eggs? Don’t be such a fool, no such thing exists. Next you’ll be talking about them Gist trucks again. I’m a bit disappointed that not only did I lose out to Kev, but he actually got two of his entries in the top three, leaving me in an uncomfortable Kev sandwich. Is there any prize for second place? The price for second place is a Kev sandwich. If that is the price then I am clearly already paying it. But what is the prize? You’ll see. Patience is both a virtue and also an eight letter word. When will I see? Will I see soon? I know you’ve seen me keen but have you seen when I’ll see? I have received, eaten and enjoyed my prize. Many thanks my Prize Master. I have seen when you’ll see and it will be very soon. Yo win, Yo treat, big up the prize winning community! I can’t wait until I see. I’m keen to see when I see. And you’ve seen me keen so you can see how I look while I wait to see when I see. I can’t wait until I send to you what I will be sending for you to see with your seeing eyes. Your eyes will seen what will be sent and has been soon with eyes, and hands. Just see. I will see, as soon as I’m able to see what it is you’re saying that you’re sending to me. Until you send it and I see it I’m afraid I’ll just have to do without seeing it, you see. I think the situation’s pretty clear. Did you receive the thing that I sent for you to see with your own sight? I did. I’m not sure that I have the words to adequately convey the feelings or thoughts I experienced as I opened it. But I can tell you this: it was absolutely delicious.